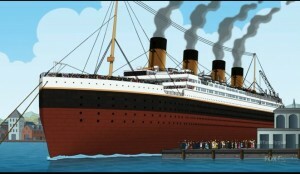 The Titanic has been portrayed dozens of times in movie, whether it is in movies, television, or even cartoon form. 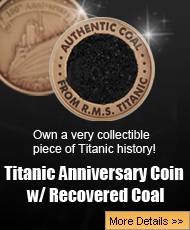 However, before the Titanic was found in 1985, it was quite common for anything about the big magnificent ship to be wrong, and those that devote their lives to the study of Titanic were used to the fact that things about her were going to be portrayed wrong simply because they did not know better just yet about what happened to her that night including the fact she split in two pieces. However, once RMS Titanic was found, TV movies, miniseries, and cartoons were supposed to be correct, but unfortunately that was not always the case. One interesting cartoon TV show that actually got it right was Family Guy, and on January 4, 2015, the popular cartoon show took on this complicated subject with pretty hilarious results. For those not familiar with Family Guy, here is a quick lesson about it, the baby Stewie is a genius, and in his boredom he built a time machine. Now the show has used Stewie’s time machine for a number of different episodes including going back to Nazi-invaded Poland to rescue a friend or just messing around with history just to see what would happen. However, in this case, Stewie, and the talking dog named Brian, take the eldest son, a not so bright blond named Chris, out for a little history lesson because the teenage boy is about to flunk the 9th grade. Despite their best efforts, and many stops along time, the three time travelers end up in England, and a fight ensues because Chris reveals that he has learned nothing from his trip. Stewie, in his frustration, calls his older brother a moron, and the teenager runs off crying. 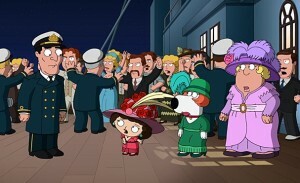 While searching for Chris, Stewie and Brian end up in Southampton, and calls down to them from the Titanic‘s deck as the ship is preparing to leave. 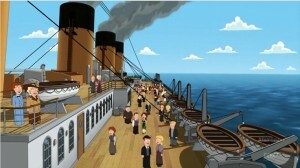 Knowing what happens to the Titanic, Stewie and Brian sneak on board. The ship looks great for a cartoon, and they actually did get it right in terms of the size and shape, but the announcement for the fact a karaoke contest is about to begin reminds the audience that this is Family Guy after all, and there will be some jokes in it, and frankly, imagining some of the richest people in the world singing karaoke was a pretty funny image. There are some nice images of the ship, and even Stewie and Brian are impressed with the ship’s size and just how magnificent she really was. 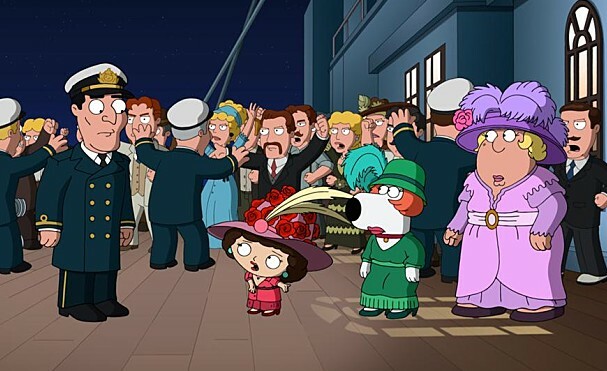 The pair split up to find Chris, and there are some jokes made about steerage class passengers, but again, this is Family Guy, and the creators are equally opportunity offenders. 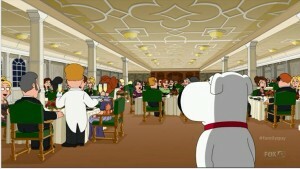 Though it is funny that when Brian goes down into the steerage section, everyone looks just like Peter. Another thing to note is that the steerage section looks just like the images in every Titanic book ever created with the stairs leading down, and when Brian goes down the Grand Staircase into the First Class Dining Saloon, everything is right including those green chairs everyone has seen, and let’s not forget those crystal chandeliers. Stewie and Brian do find Chris, but right when they are about to get on the return pad to leave the ship, the iceberg strike happens. 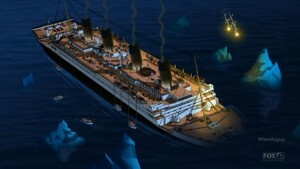 It must be pointed out that this is the one area that the cartoon did not get right because everyone gets knocked to the floor, and of course, every Titanic enthusiast knows that people didn’t feel when the iceberg happened, but since this is a cartoon, clearly the creators had to make it more noticeable. The return pad gets wet, and the three men are now stranded on the biggest ship in the world that is about to sink. There is only one thing to do, and that is dress up as women in order to leave the ship. When an officer refuses to let them on board, Chris throws him overboard, orders everyone to move over so they can climb on board. The Titanic sinking actually looked good, and the animators even got the angle right as she slid underwater, which was pretty impressive. Everyone gets home just fine, and when Stewie and Brian look into the man Chris threw overboard it turned out that it was the relative of his history teacher, which means that his history teacher was never born. When Chris goes to school the next day, he has a whole new teacher who doesn’t believe in tests. A couple of sides notes: When water comes down the Grand Staircase into the dining saloon, Chris looks around and says how this would make a great movie. 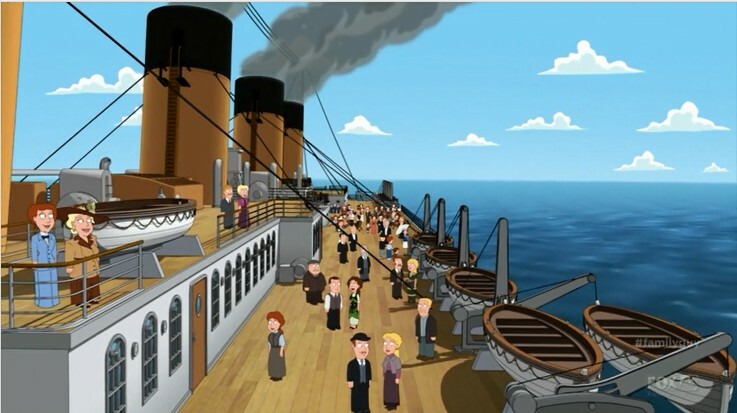 Also, Stewie gave the Titanic musicians the sheet music to “Highway to the Danger Zone” by Kenny Loggins, and the musicians were playing that song during the sinking. 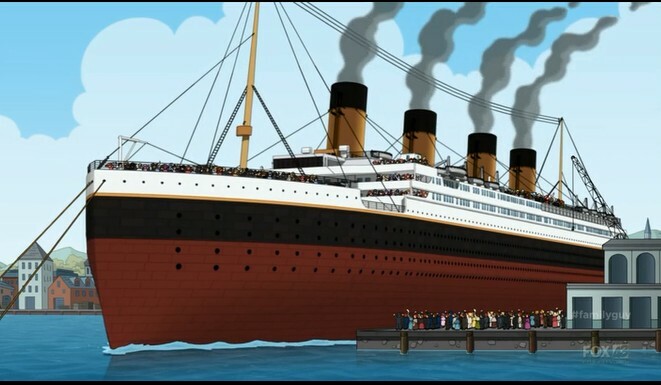 Family Guy took on the sinking of the RMS Titanic, and despite a couple of minor flaws, and a sped up sinking time, it was pretty accurate, which was quite surprising and funny too.